The index opened positive and saw buying interest from the morning itself to scale one resistance after another to move above 7600 and close near the highs at 7611.35, a huge gain of 102.55 points. The broader market was also positive, with 1155 advances to 398 declines. Broader range for July series comes at 7000-8000. 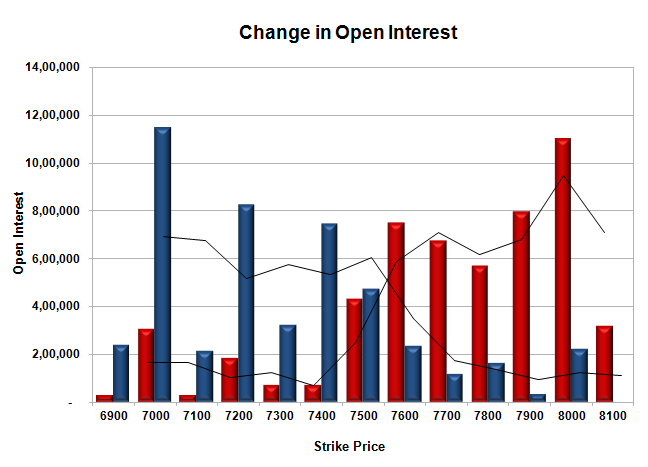 Call option 7700-8100 added 26.87 lacs huge amount of OI with short covering seen at 7600 and below strike prices. Put option 7800-7100 added 18.92 lacs huge amount of OI with small profit booking seen at 7000 strike price. 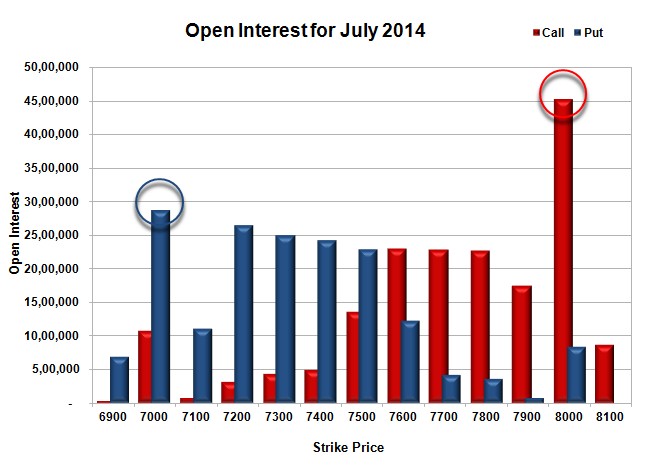 Nifty Open Interest is at 1,39,74,750 down by 78,150, with increase in price, most probably small short covering. Bank Nifty Open Interest is at 21,34,475 up by 50,075, with increase in price, most probably long build-up. FII’s sold 4.24 lacs Futures, mostly long liquidation as their net OI decreased by 8477 contracts (includes 33922 longs to 42399 shorts for the day) and the average price per contract comes to around 7640.00. FII’s Index future open contract as on date is 189593 Longs to 106520 Shorts. PCR Open Interest (Volume) is at 0.898. Initial support at 7500, with OI of 32.25 lacs and best at 7000 with OI of 36.17 lacs. Initial resistance at 7700, with OI of 27.49 lacs and best at 8000 with highest OI of 60.62 lacs. Day Range as per Option Table is 7524 - 7659 and as per VIX is 7540 - 7683 with 7589 as the Pivot. The index opened strong above 7500 and after making initial high of 7539, saw selling pressure and dipped to the lows of the day at 7482. Weekend short covering saw the index close in green at 7508.80, a small gain of 15.60 points. On a week on week basis the index was flat. The broader market was just positive, with 823 advances to 712 declines. Range for July at start of series comes at 7000-8000. 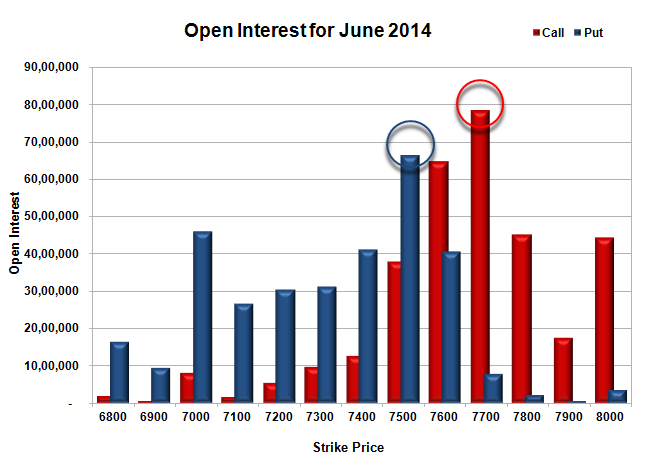 Call option 7500-8000 added 24.04 lacs huge amount of OI with profit booking seen at 8100 and above strike prices. Put option 7500-6900 added 23.75 lacs huge amount of OI with small short covering seen at 7800 strike price. 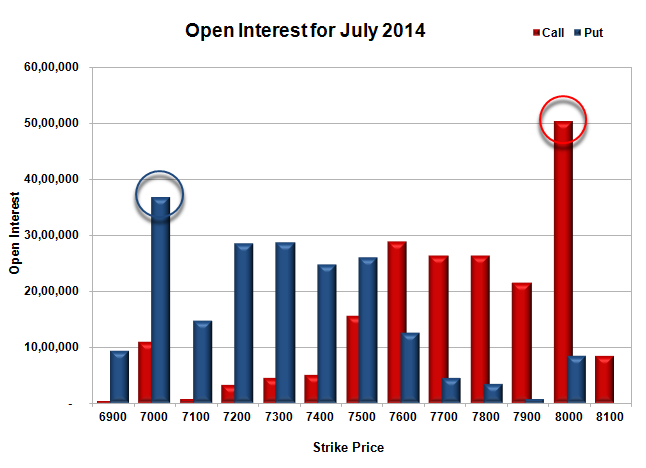 Nifty Open Interest is at 1,40,52,900 down by 1,65,700, with increase in price, most probably small short covering. 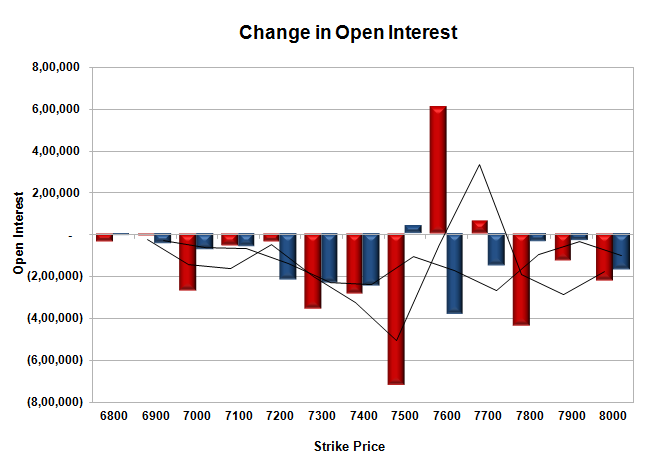 Bank Nifty Open Interest is at 20,84,400 up by 65,100, with decrease in price, most probably huge short build-up. FII’s sold 0.14 lacs Futures, mostly long liquidation as their net OI decreased by 285 contracts (includes 24774 longs to 25059 shorts for the day) and the average price per contract comes to around 7545.40. FII’s Index future open contract as on date is 194014 Longs to 102464 Shorts. PCR Open Interest (Volume) is at 0.921. 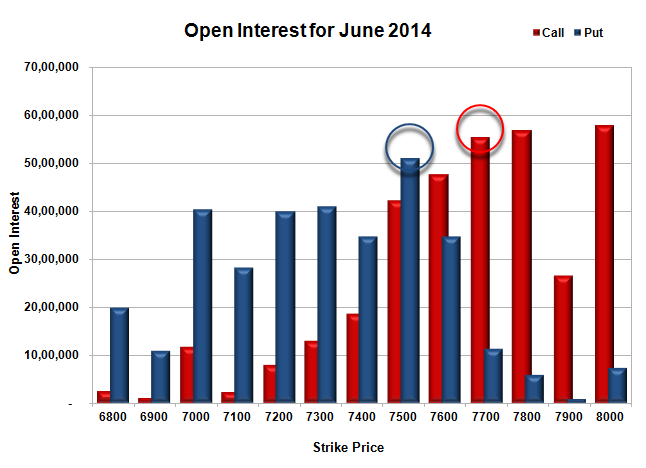 Initial support at 7500, with OI of 26.00 lacs and best at 7000 with OI of 36.83 lacs. Initial resistance at 7600, with OI of 28.85 lacs and best at 8000 with highest OI of 50.29 lacs. Day Range as per Option Table is 7441 - 7571 and as per VIX is 7440 - 7578 with 7510 as the Pivot. The index opened weak and saw selling pressure within the first few minutes of trade to the lows near 7510 and stayed in a narrow range for the next 4 hours. A huge sell-off in the last hour saw the index close below 7500 at 7493.20, a huge loss of 76.05 points. The broader market was also weak, with 685 advances to 861 declines. Range for July at start of series comes at 7000-8000. Call option 7500-8100 added 46.27 lacs huge amount of OI. Put option 8000-6900 added 47.16 lacs small amount of OI. Nifty Open Interest is at 1,42,18,300 up by 32,97,750, whereas June series liquidated 33.62 lacs with decrease in price, most probably 100% rollover. Bank Nifty Open Interest is at 20,19,300 up by 8,85,550, whereas June series liquidated 4.15 lacs with decrease in price, most probably 100% rollover with huge short build-up. FII’s bought 2.02 lacs Futures, mostly long build-up as their net OI increased by 38741 contracts (includes 137416 longs to 133369 shorts for the day) and the average price per contract comes to around 7544.35. FII’s Index future open contract as on date is 197066 Longs to 105231 Shorts. 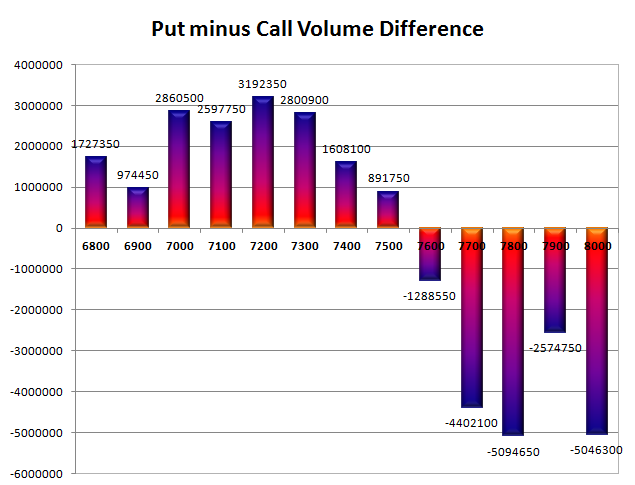 PCR Open Interest (Volume) at start of the series is below 1 at 0.913. 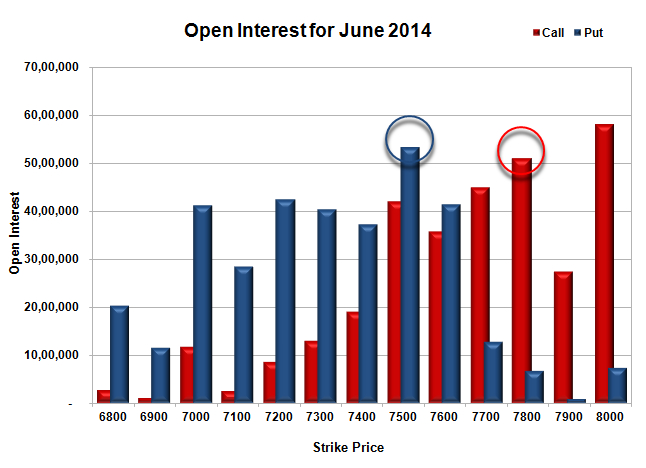 Initial support at 7400, with OI of 24.20 lacs and best at 7000 with OI of 28.71 lacs. Initial resistance at 7600, with OI of 23.09 lacs and best at 8000 with highest OI of 45.24 lacs. Day Range as per Option Table is 7438 - 7575 and as per VIX is 7424 - 7563 with 7515 as the Pivot. The index opened flat to positive and stayed in a very narrow range of just 32 points for the entire session and closed just below at 7569.25, a small loss of 10.95 points. The broader market though was just positive, with 833 advances to 713 declines. Expected range for Expiry now at 7500-7600. 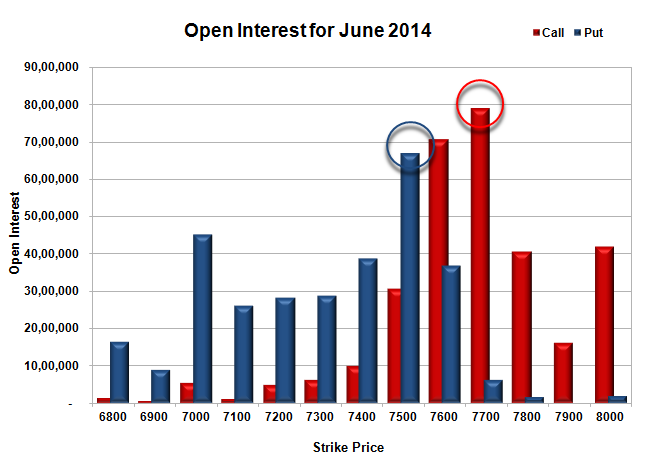 Call option 7600-7700 added 6.72 lacs huge amount of OI with profit booking seen at 7800 and above strike prices. Put option 7500 added 0.38 lacs small amount of OI with short covering seen at 7600 and above strike prices. Nifty Open Interest is at 92,69,800 down by 20,97,750, whereas next series added 31.16 lacs with decrease in price, most probably 100% rollover with some short build-up in next series. Bank Nifty Open Interest is at 15,18,450 down by 2,74,400, whereas next series added 3.24 lacs with decrease in price, most probably 100% rollover with some short build-up in next series. FII’s bought 2.26 lacs Futures, mostly long build-up as their net OI increased by 30194 contracts (includes 149375 longs to 144845 shorts for the day) and the average price per contract comes to around 7603.19. FII’s future open contract as on date is 454094. PCR Open Interest (Volume) has moved above 1 and now at 1.013. 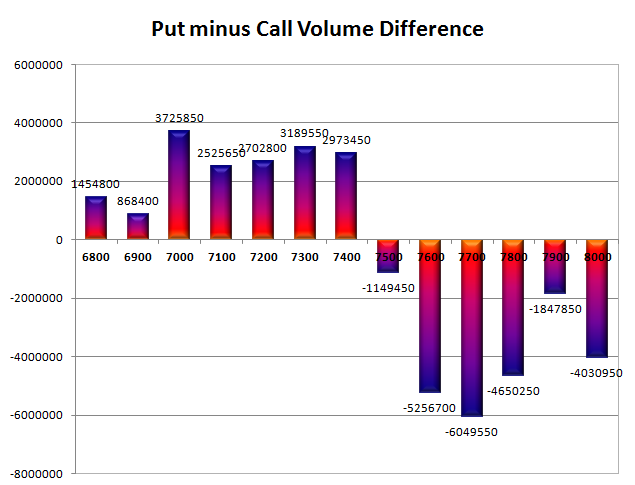 Initial and best support at 7500, with huge OI of 66.80 lacs and below that at 7400 with OI of 38.77 lacs. Initial and super resistance at 7600, with huge OI of 70.81 lacs and above that 7700 with highest OI of 79.06 lacs. 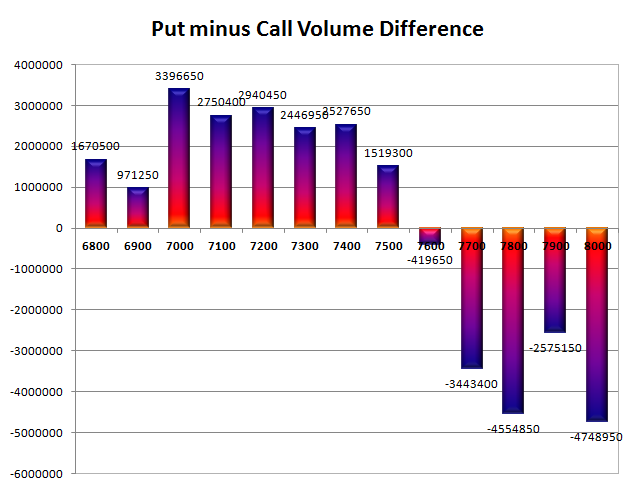 Expiry Day Range as per Option Table is 7505 - 7638 and as per VIX is 7497 - 7642 with 7572 as the Pivot. The index opened positive and saw huge buying interest to move towards the highs of the day around 7593, but a small sell-off towards the end saw the index close at 7580.20, a huge gain of 86.85 points. The broader market was positive, with 1118 advances to 422 declines. Expected range for the series now at 7500-7700. 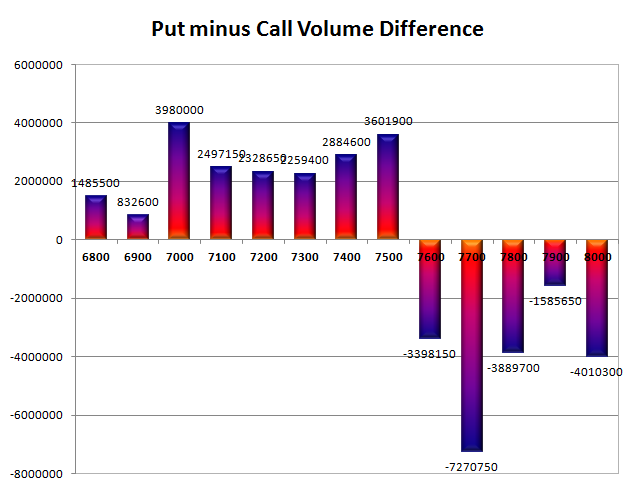 Call option 7700 added 9.96 lacs huge amount of OI with short covering seen at 7600 and below strike prices. Put option 7600-7500 added 35.44 lacs huge amount of OI with profit booking seen at 7400 and below strike prices. Nifty Open Interest is at 1,13,67,550 down by 21,87,150, whereas next series added 36.87 lacs with increase in price, most probably 100% rollover with huge long build-up in next series. Bank Nifty Open Interest is at 17,92,850 down by 3,57,775, whereas next series added 3.46 lacs with increase in price, most probably 100% rollover. FII’s bought huge 8.14 lacs Futures, mostly long build-up as their net OI increased by 25015 contracts (includes 213021 longs to 196734 shorts for the day) and the average price per contract comes to around 7620.93. FII’s future open contract as on date is 423900. PCR Open Interest (Volume) has moved up to 0.990. 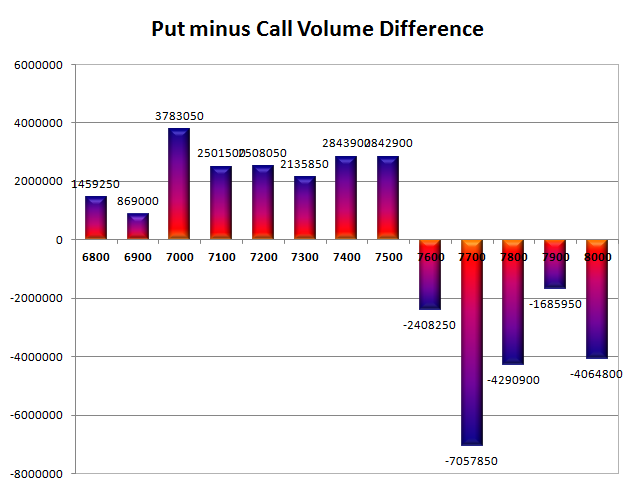 Initial and best support at 7500, with huge OI of 66.42 lacs and below that at 7400 with OI of 41.23 lacs. 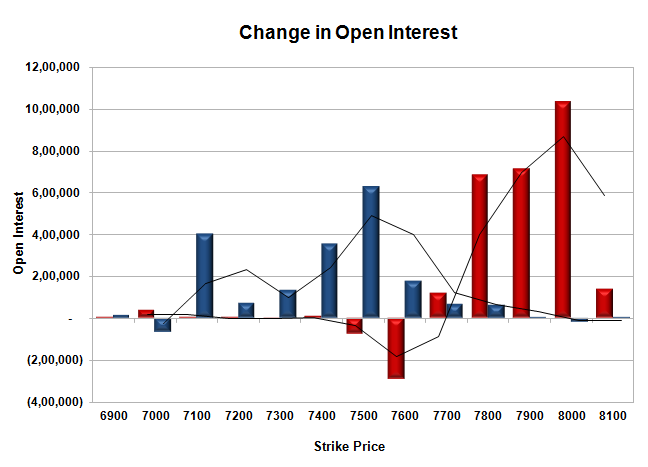 Initial resistance at 7600, with huge OI of 64.71 lacs and above that 7700 with highest OI of 78.44 lacs. 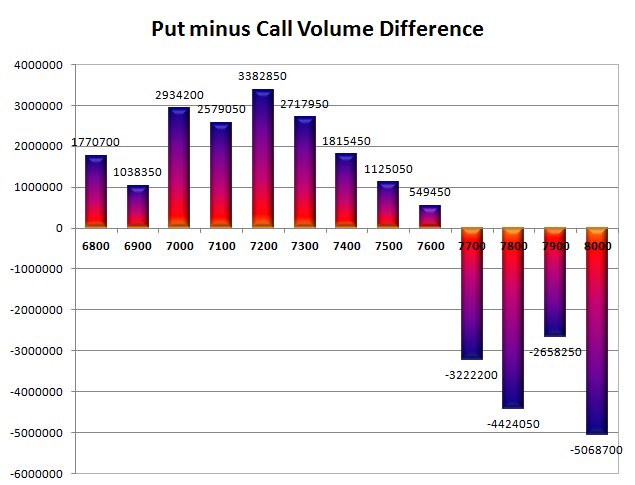 Day Range as per Option Table is 7493 - 7642 and as per VIX is 7504 - 7656 with 7563 as the Pivot. The index opened flat and after making initial high around 7535, went down with each passing hour to the lows of the day around 7441. The index saw value buying around the lows to move up and close just weak at 7493.35, a loss of 18.10 points. The broader market was just positive, with 782 advances to 745 declines. Expected range for the series now at 7400-7600. Call option 7500-7700 added 18.46 lacs huge amount of OI with profit booking seen at 7800 and above strike prices. 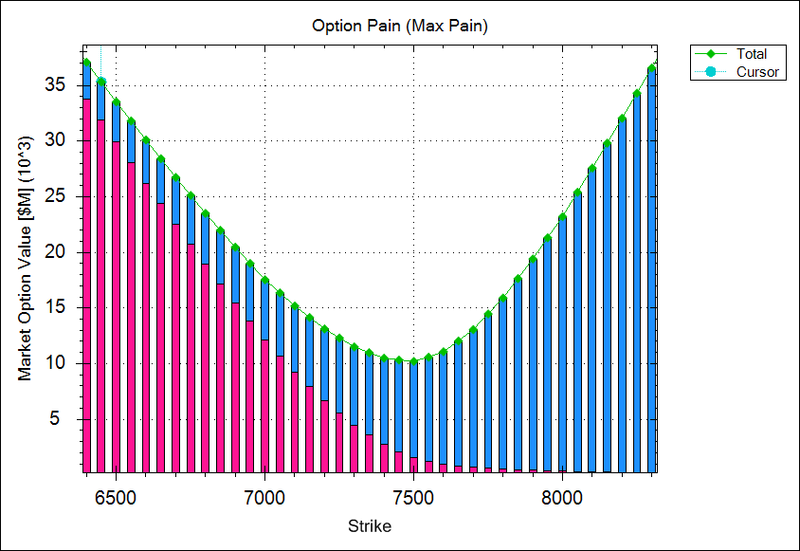 Put option 7000 added 0.90 lacs huge amount of OI with short covering seen at 7500 and above strike prices. Nifty Open Interest is at 1,35,54,700 down by 4,10,250, whereas next series added 15.82 lacs with decrease in price, most probably 100% rollover with huge short build-up in next series. Bank Nifty Open Interest is at 21,50,625 down by 77,650, whereas next series added 1.87 lacs with increase in price, most probably 100% rollover with long build-up in next series. FII’s sold 0.23 lacs Futures, mostly short build-up as their net OI increased by 24414 contracts (includes 80519 longs to 80977 shorts for the day) and the average price per contract comes to around 7518.82. FII’s future open contract as on date is 398885. 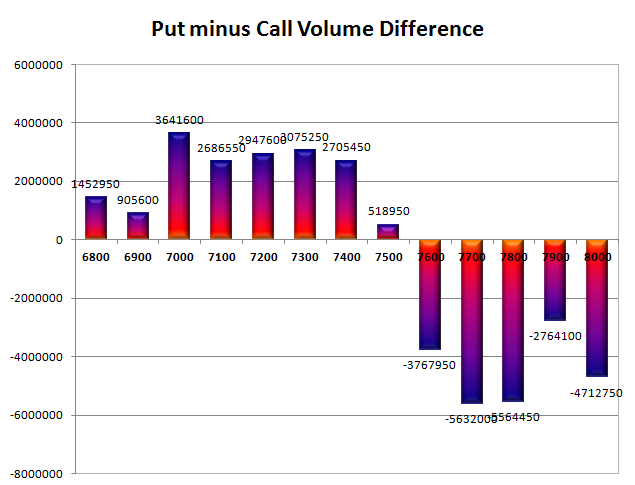 PCR Open Interest (Volume) is near the lows of the series at 0.872. 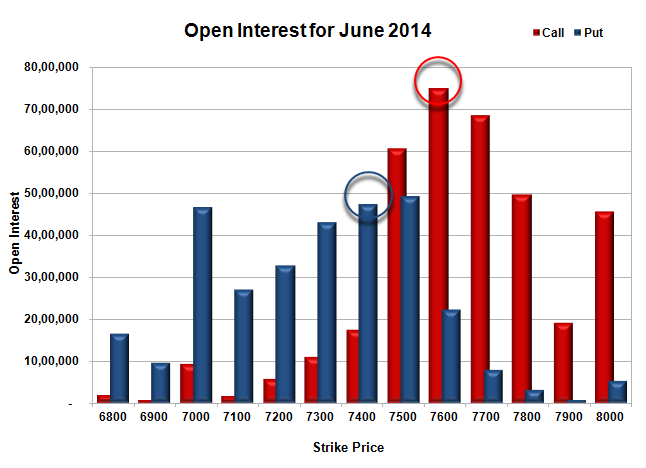 Initial and best support still at 7500, with huge OI of 49.29 lacs and below that at 7400 with OI of 47.27 lacs. 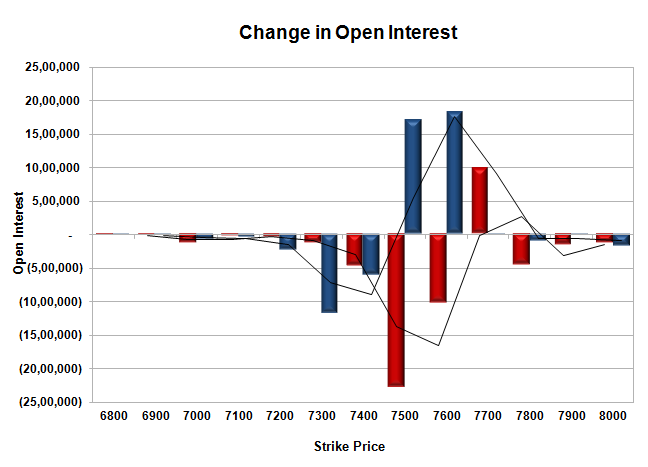 Initial and best resistance at 7600, with highest OI of 74.88 lacs and above that 7700 with huge OI of 68.48 lacs. Day Range as per Option Table is 7417 - 7566 and as per VIX is 7419 - 7568 with 7490 as the Pivot. The index opened flat and stayed in a very narrow range of 40 points for the better part of the day, but saw selling pressure around the end of the day to close near the lows at 7511.45, a loss of 29.45 points. On a week on week basis the index lost 30.65 points or 0.41%. The broader market was also weak, with 591 advances to 968 declines. Expected range for the series now at 7400-7700. Call option 7500-7600 added 4.39 lacs huge amount of OI with profit booking seen at 7900 and above strike prices. Put option 7500-7300 added 6.43 lacs huge amount of OI with short covering seen at 7600 and above strike prices. Nifty Open Interest is at 1,39,64,950 down by 2,46,900, whereas next series added 3.56 lacs with decrease in price, most probably 100% rollover with short build-up in next series. Bank Nifty Open Interest is at 22,28,275 down by 1.00,725, whereas next series added 0.68 lacs with decrease in price, most probably some rollover with long liquidation. FII’s bought 0.51 lacs Futures, mostly long build-up as their net OI increased by 2677 contracts (includes 49087 longs to 48060 shorts for the day) and the average price per contract comes to around 7526.24. FII’s future open contract as on date is 374471. PCR Open Interest (Volume) is still at 0.897. 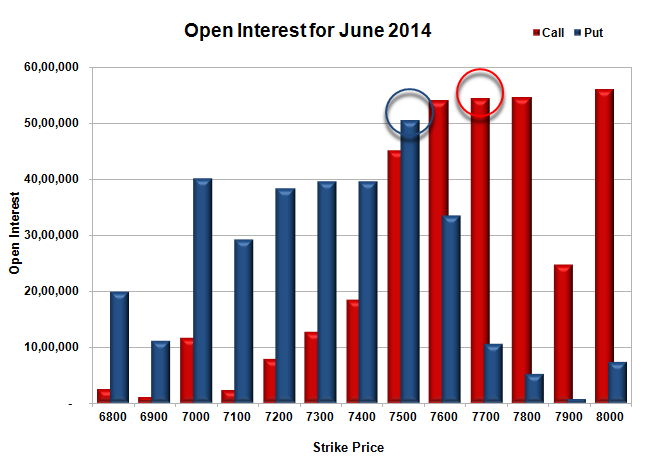 Initial and best support still at 7500, with huge OI of 52.40 lacs and below that at 7400 with OI of 47.29 lacs. 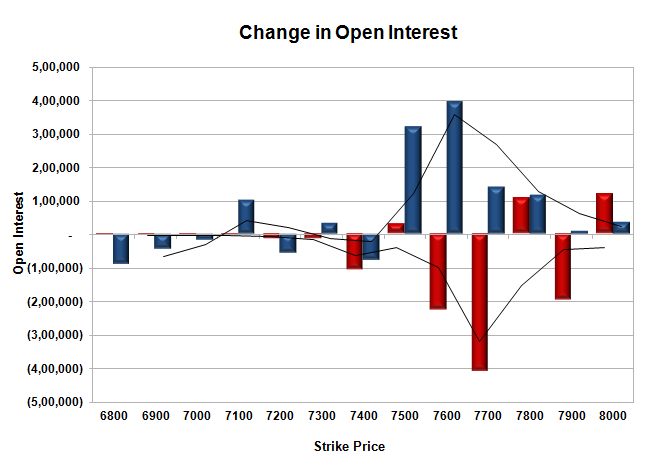 Initial and best resistance at 7600, with highest OI of 70.06 lacs and above that 7700 with huge OI of 66.89 lacs. Day Range as per Option Table is 7444 - 7595 and as per VIX is 7437 - 7586 with 75 as the Pivot. The index opened positive around 7580 and went on to touch the highs of the day around 7606 with the first few minutes of trade. The sellers got active around the highs and moved it down to 7502, but some lower level buying saw the index close at 7540.70, a loss of 17.50 points. The broader market was also weak, with 658 advances to 867 declines. Expected range for the series now at 7400-7700. Call option 7500-7900 added 25.71 lacs huge amount of OI with short huge covering seen at 7400 and below strike prices. 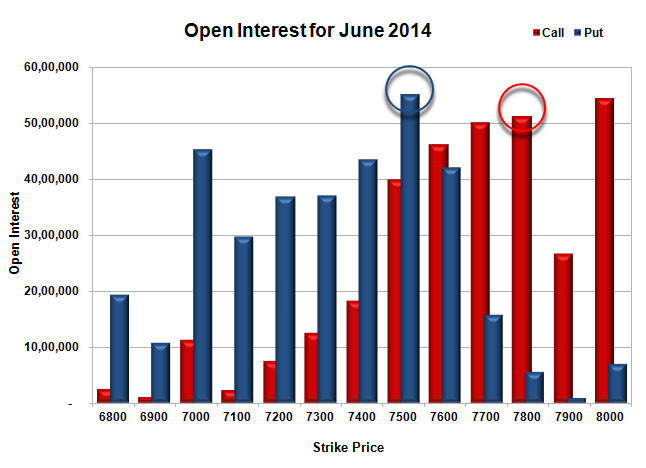 Put option 7200-7000 added 2.96 lacs huge amount of OI with short covering seen at 7600 and above strike prices. Nifty Open Interest is at 1,42,11,850 up by 85,700, whereas next series added 3.06 lacs with decrease in price, most probably short build-up in both series. Bank Nifty Open Interest is at 23,29,000 down by 70,525, whereas next series added 0.18 lcas with decrease in price, most probably some rollover with long liquidation. FII’s sold huge 6.07 lacs Futures, mostly short build-up as their net OI increased by 17702 contracts (includes 59826 longs to 71972 shorts for the day) and the average price per contract comes to around 7559.03. FII’s future open contract as on date is 371794. PCR Open Interest (Volume) has gone down near the lows of the series at 0.893. Initial and best support still at 7500, with huge OI of 51.11 lacs and below that at 7400 with OI of 44.26 lacs. 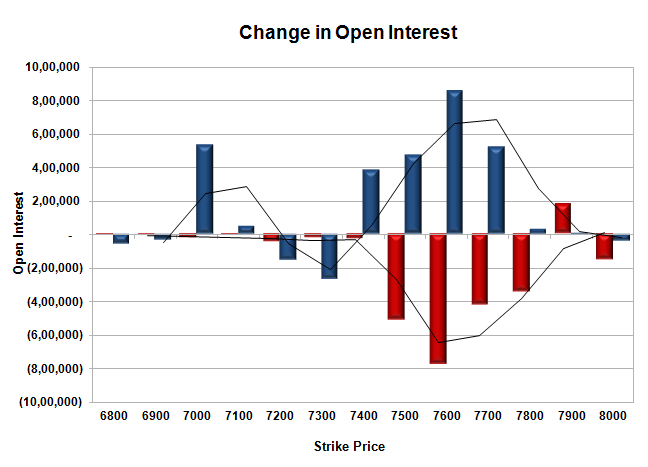 Initial and best resistance at 7600, with highest OI of 68.49 lacs and above that 7700 with huge OI of 66.90 lacs. Day Range as per Option Table is 7466 - 7627 and as per VIX is 7467 - 7615 with 7550 as the Pivot. The index opened flat to negative and stayed in a narrow range for the better part of day, but saw huge short covering rally to close near the highs at 7631.70, huge gain of 98.15 points. The broader market was also strong, with 1172 advances to 382 declines. Expected range for the series now at 7400-7800. 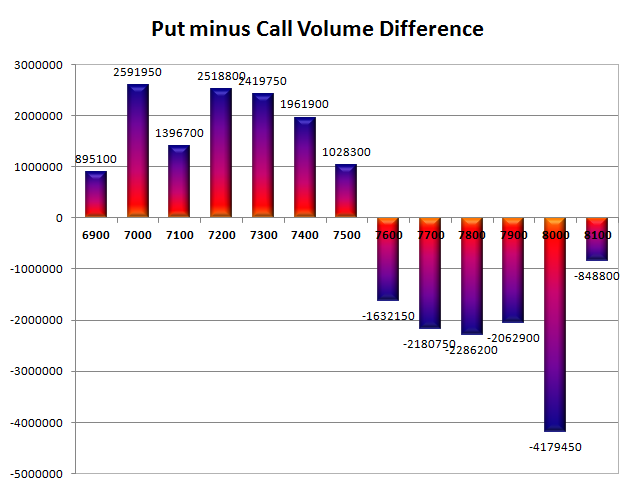 Call option 7900 added 1.80 lacs huge amount of OI with short huge covering seen at 7600 and below strike prices. Put option 7700-7400 added 22.30 lacs huge amount of OI with profit booking seen at 7300 and below strike prices. 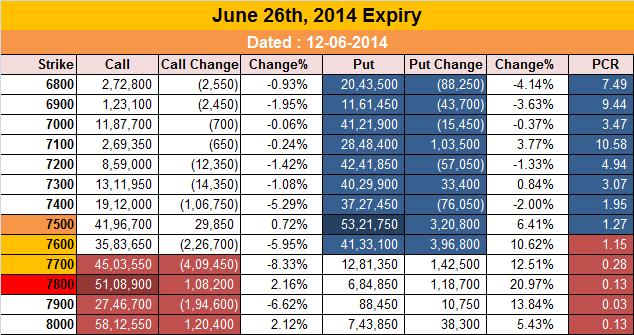 Nifty Open Interest is at 1,48,09,050 down by 1,50,050, with increase in price, most probably short covering. Bank Nifty Open Interest is at 24,33,325 up by 1,01,475, with increase in price, most probably huge long build-up. FII’s sold 2.43 lacs Futures, mostly short build-up as their net OI increased by 2201 contracts (includes 53036 longs to 57897 shorts for the day) and the average price per contract comes to around 7666.35. FII’s future open contract as on date is 379369. PCR Open Interest (Volume) jumped to 1.065. Initial support now at 7600, with huge addition for the day at 8.55 lacs and below that at 7500 with highest OI of 55.23 lacs. 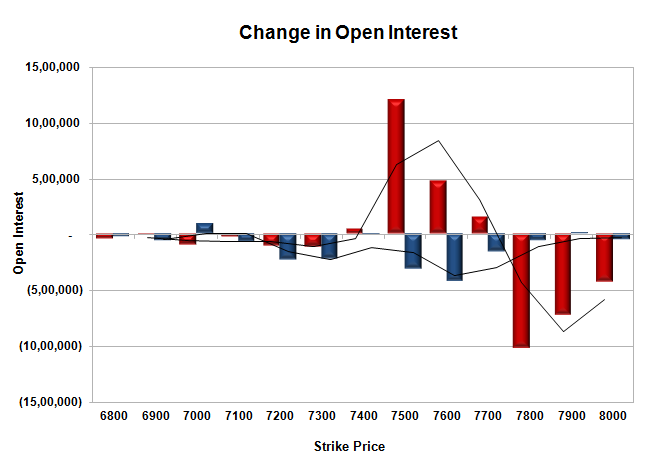 Initial resistance at 7700, with OI of 50.24 lacs and above that 7800 with huge OI of 51.22 lacs. Day Range as per Option Table is 7525 - 7680 and as per VIX is 7561 - 7702 with 7593 as the Pivot. The index opened flat to negative and went on to touch the lows of the day around 7488. Nifty saw some buying interest around the lows and moved up to close above the psychological level of 7500, but still weak at 7533.55, small loss of 8.55 points. The broader market was also weak, with 693 advances to 844 declines. Expected range for the series now at 7400-7800. Call option 7500-7600 added 9.48 lacs huge amount of OI with profit booking seen at 7700 and above strike prices. 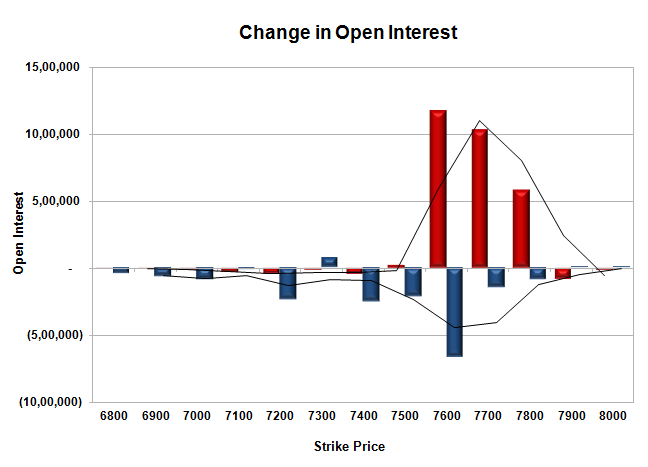 Put option 7400 added 4.95 lacs of OI with short covering seen at 7500 and above strike prices. Nifty Open Interest is at 1,49,59,100 down by 1,74,500, with decrease in price, most probably long liquidation. Bank Nifty Open Interest is at 23,31,850 down by 54,450, with decrease in price, most probably long liquidation. FII’s bought 1.03 lacs Futures, mostly long build-up as their net OI increased by 24017 contracts (includes 62096 longs to 60035 shorts for the day) and the average price per contract comes to around 7555.47. FII’s future open contract as on date is 377168. PCR Open Interest (Volume) is still below 1 at 0.953. 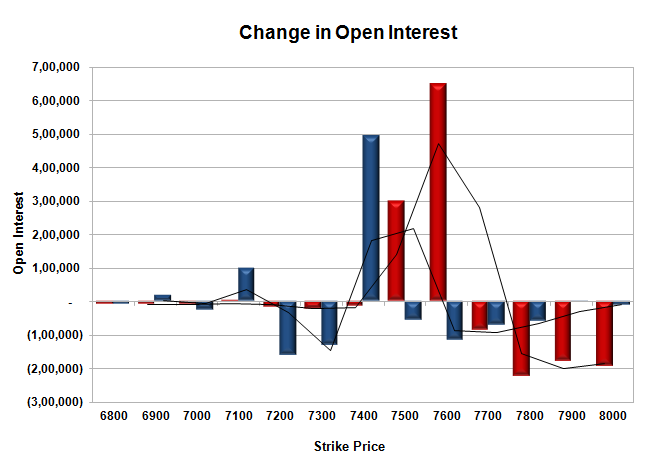 Initial and best support still at 7500, with OI of 50.50 lacs and below that at 7400 with OI of 39.70 lacs. Initial and super resistance at 7600, with OI of 54.06 lacs and above that 7700 with huge OI of 54.46 lacs. Day Range as per Option Table is 7451 - 7599 and as per VIX is 7463 - 7604 with 7523 as the Pivot. The index opened positive and stayed within a narrow range for the better part of first half, but saw huge unwinding from thereon to close near the lowest point at 7542.10, a huge loss of 107.80 points. On a week on week basis the index lost 41.30 points or approx 0.54%. The broader market was also very weak, with just 299 advances to 1282 declines. Expected range for the series now at 7400-7800. Call option 7600-7800 added 27.81 lacs huge amount of OI with profit booking seen at 7900 and above strike prices. 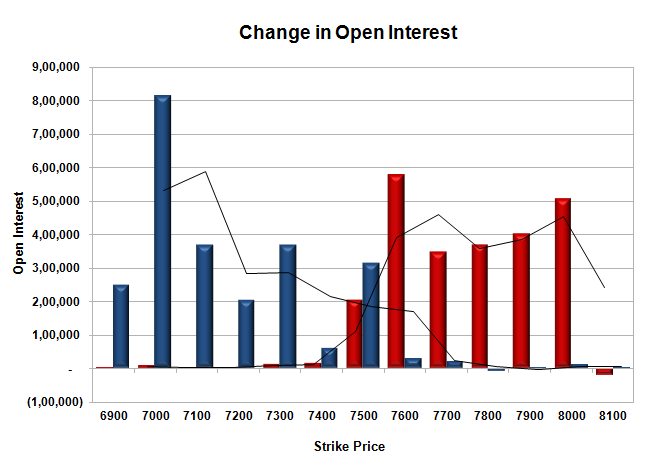 Put option 7300 added 0.70 lacs of OI with short covering seen at 7500 and above strike prices. Nifty Open Interest is at 1,51,33,600 down by 15,58,650, with decrease in price, most probably huge long liquidation. 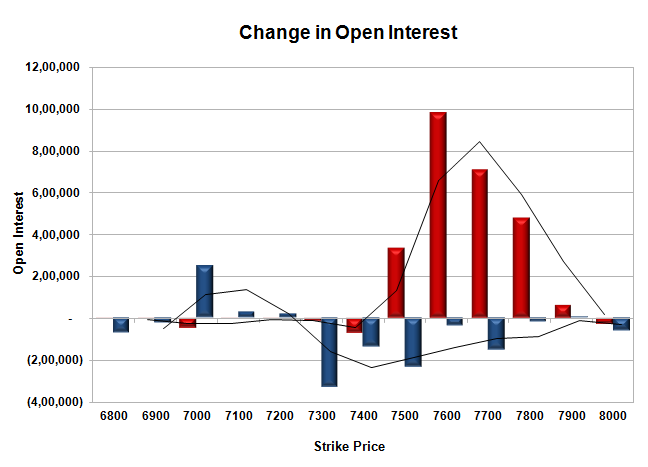 Bank Nifty Open Interest is at 23,86,300 up by 27,800, with decrease in price, most probably small short build-up. FII’s bought huge 7.49 lacs Futures, mostly short build-up as their net OI increased by 4293 contracts (includes 52509 longs to 67498 shorts for the day) and the average price per contract comes to around 7560.91. FII’s future open contract as on date is 353151. 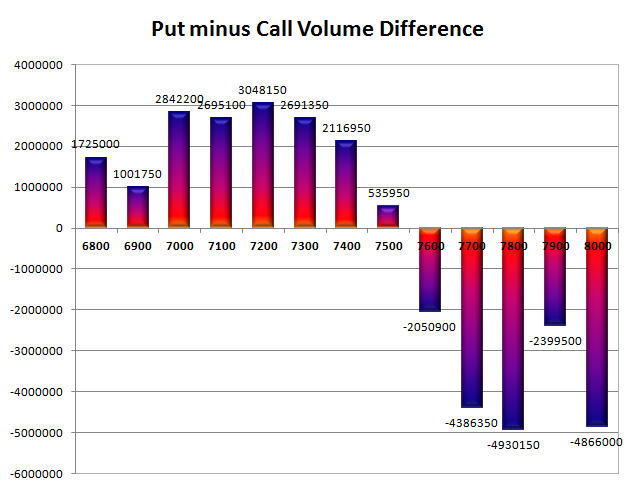 PCR Open Interest (Volume) has again dipped below 1 at 0.959. Initial and best support at 7500, with OI of 51.06 lacs and below that at 7400 with OI of just 34.75 lacs. Initial and good resistance at 7600 with OI of 47.58 lacs and above that 7700 with huge OI of 55.32 lacs. Day Range as per Option Table is 7492 - 7650 and as per VIX is 7472 - 7612 with 7582 as the Pivot. The index opened positive and stayed within a narrow range with all dips being bought with ease and the index closed positive at 7649.90, small gain of 23.05 points. The broader market was also positive, with 822 advances to 763 declines. Expected range for the series now at 7500-7800. 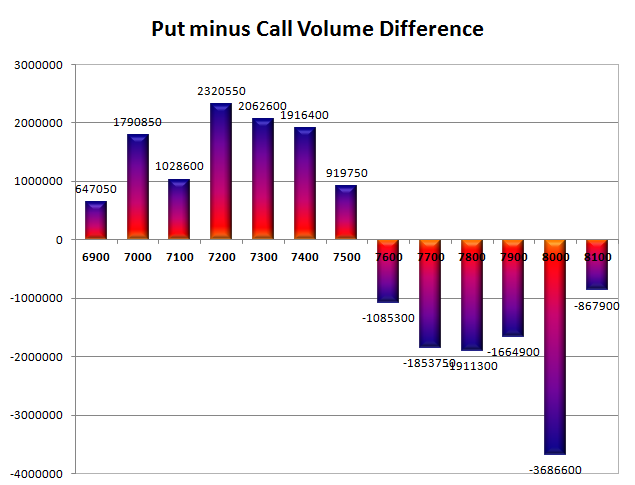 Call option 7800, 8000 added 2.29 lacs huge amount of OI with huge short covering seen at 7600 and lower strike prices. Put option 7800-7500 added 9.79 lacs huge amount of OI with profit booking seen at 7400 and lower strike prices. 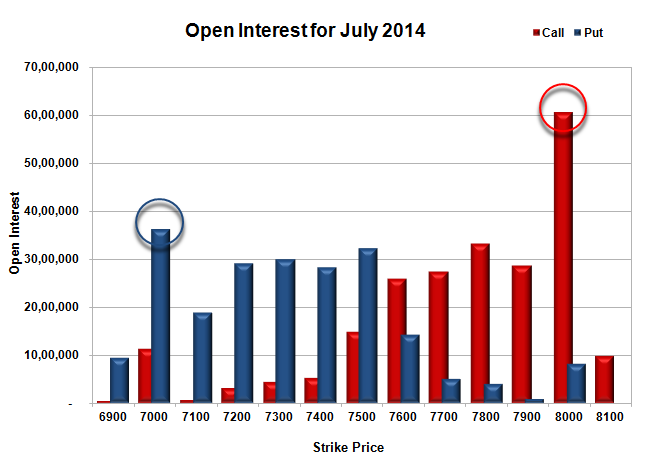 Nifty Open Interest is at 1,66,92,250 up by 6,07,300, with increase in price, most probably long build-up. Bank Nifty Open Interest is at 23,58,500 down by 9,100, with increase in price in future, most small short covering. FII’s bought 1.99 lacs Futures, mostly long build-up as their net OI increased by 16847 contracts (includes 35344 longs to 31371 shorts for the day) and the average price per contract comes to around 7676.73. FII’s future open contract as on date is 348858. PCR Open Interest (Volume) is at 1.063. 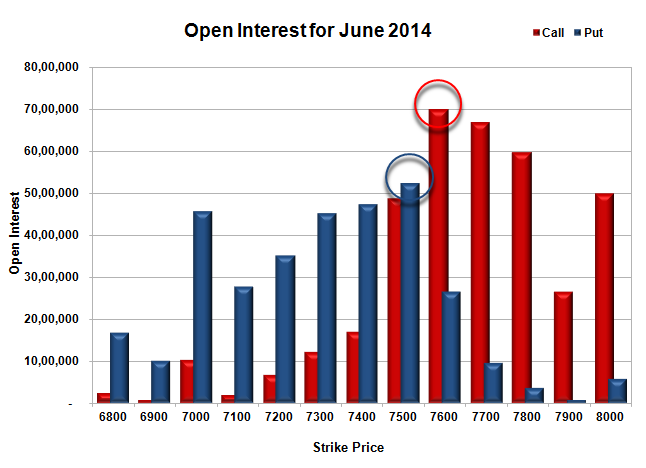 Initial support at 7600, with OI of 41.33 lacs and below that at 7500 with huge OI of 53.22 lacs. 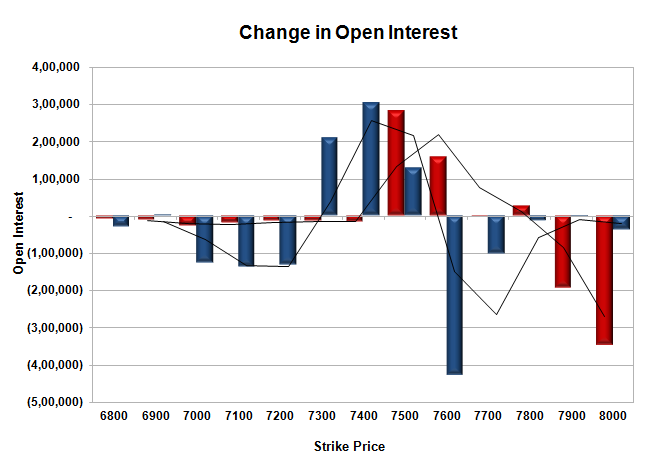 Initial resistance still at 7700, with OI of 45.04 lacs and above that 7800 with huge OI of 51.09 lacs. 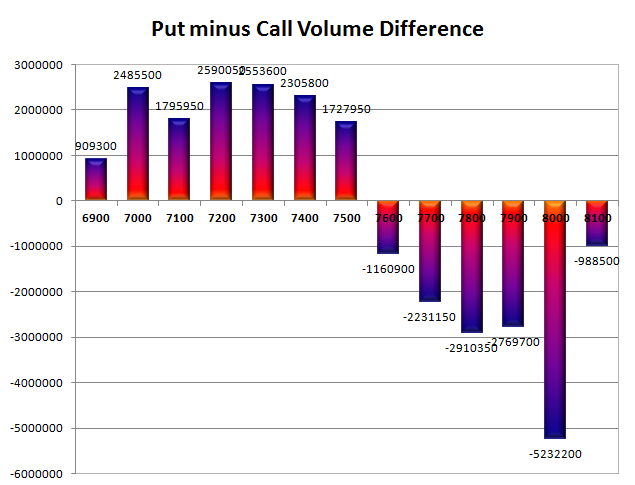 Day Range as per Option Table is 7563 - 7711 and as per VIX is 7582 - 7718 with 7634 as the Pivot.